Niantic's augmented reality catch 'em all mobile game Pokemon Go has surpassed the 800 million mark for downloads. 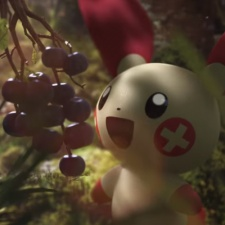 News of the milestone was revealed by the Pokemon Company’s president Tsunekazu Ishihara at the Pokemon 2018 Video Game Press Conference in Tokyo. The title has been a massive hit for all companies involved, grossing well over $1 billion through in-app purchases. Developer Niantic has also signed numerous deals with brands to sponsor real-world locations in order to attract consumers to certain areas. It was also revealed during the conference that Pokemon Go would tie into the recently revealed Let’s Go Pikachu and Let’s Go Eevee for the Nintendo Switch, which will launch on November 16th 2018. Players will be able to catch Kanto-based pokemon in Pokemon Go and then transfer them into their Nintendo Switch counterpart. More details about future collaborations between the games will be revealed in due course. Earlier this month Niantic announced a host of real-world events as a part of the Pokemon Go Summer Tour 2018. The string of events will feature romps through Germany, Chicago and Japan. Niantic is also bringing content from tropic-inspired Nintendo 3DS titles Pokemon Sun and Moon to Pokemon Go soon as a part of summer festivities. The announcements come as profits at The Pokemon Company nearly halved year-on-year to $80.8 million in the fiscal year ending February 28th 2018. As reported by Serkan Toto, the hit in profits was mainly due to decreased sales from Pokemon Go and 3DS titles Pokemon Ultra Sun and Moon. It should be stated however that the year was still the company’s second most profitable ever.